In the building of the L. Francis design, we keep as close to his original design as possible. The most obvious difference is that we are building in fiberglass for the hull, bulkheads and deck. The hull is solid, hand laid fiberglass. The deck is fiberglass with a Kledgecell foam core. The deck is finished with a Dynel cloth overlay to give the appearance of traditional canvas (but does not rot). Standard finish includes white hull (Awlgrip®), buff deck (four coats of Awlgrip® - excellent non-skid, easy to maintain), green boot stripe and green bottom. Your choice of Awlgrip® color from their standard chart is available at no additional charge. Excellent storages areas are located fore and aft. Hinged cockpit seat tops provide additional storage. The fore and aft bulkheads are cored fiberglass finished with white Awlgrip®. 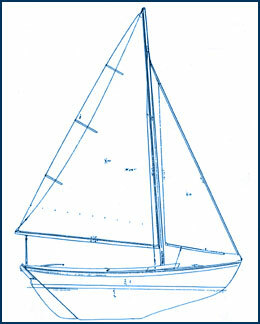 All seats, coamings, toe rail, and rub rails can be ordered in mahogany or teak while the cockpit sole and aft deck are teak. All blocks on deck can be supplied from the Harken line or as teak with bronze sheaves. All cleats are bronze. Spars are available in Awlgriped aluminum or varnished spruce.